Perfume is authentic, arrived quickly, and as described. Very pleased with this purchase and will be back for future shopping. Highly recommended. I have been wearing Si for almost a year. Almost every day I get compliments on how I smell. It is soft, subtle and just perfect for office wear. First fragrance that I have liked in some time. Sweet but not cloying and it lasts all day. i love this perfum.The scent is so sweet and it lasts all day. 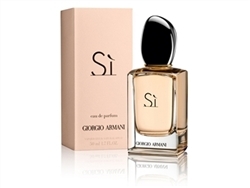 Best perfum Giorgio Armani has brought out yet.